One Test Drive at a Time. Over 175,000 trees since 2008! In one year the average car puts over 5 tons of Carbon Dioxide into the air. Now you can decrease your carbon footprint. How? With a tree! Just test-drive or purchase a Volkswagen and we'll plant a tree in your name in Mountains to Sound Greenway, the scenic byway along the I-90 corridor stretching from Seattle over Snoqualmie Pass into Central Washington. Together we can make a difference and be on the road to Carbon Neutral! Find out more on Carter's Carbon Neutral Initiative and how planting trees makes a real difference to our environment by contacting us today! Every October hundreds of volunteers come out to plant thousands of trees in the Mountains to Sound Greenway. Volunteer and help us plant trees! If you're ready to get down and dirty, we can really use your help actually planting all these native trees. Bring a friend or bring your kids. it really is a good time, and you'll be doing something great for our future. The Fall is when we plant trees, however there are plenty of restoration events year round to help prepare the areas we're going to plant in. Find out more and make a real difference to our environment by contacting us today! 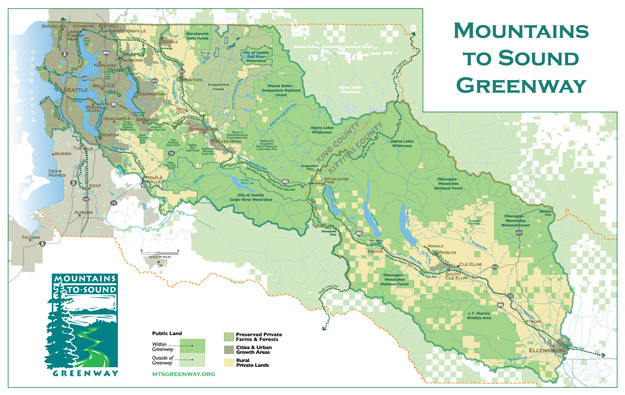 Click the logo to find out more about the Mountains to Sound Greenway. Vast forests. Meadow-strewn mountain peaks. Small farms that feed city markets. Rural communities and vibrant cities. Hundreds of places for skiing and hiking kayaking and cycling. That's the Mountains to Sound Greenway. Weaving together the urban and the wild, the Greenway connects 1.4 million acres surrounding I-90 with more than 800,000 acres of land now publicly owned, from city parks to expansive public forests. Learn more about the Greenway by clicking here.